Helping clients manage their digital profiles is a reality many digital professional face these days. Facebook and Twitter have made it easy to switch between accounts, but apps like Instagram, Vine and Snapchat require you to log in and out each time you want to switch profiles. This process doesn’t exactly encourage you to proactively change your Instagram account to that of your clients, which in turn isn’t ideal for your brands engagement. To make matters worse there are loads of apps out there that say you can have multiple Instagram accounts, but the reality is you can’t publish to multiple Instagram profiles through one app – you still have to log in and log out each time. 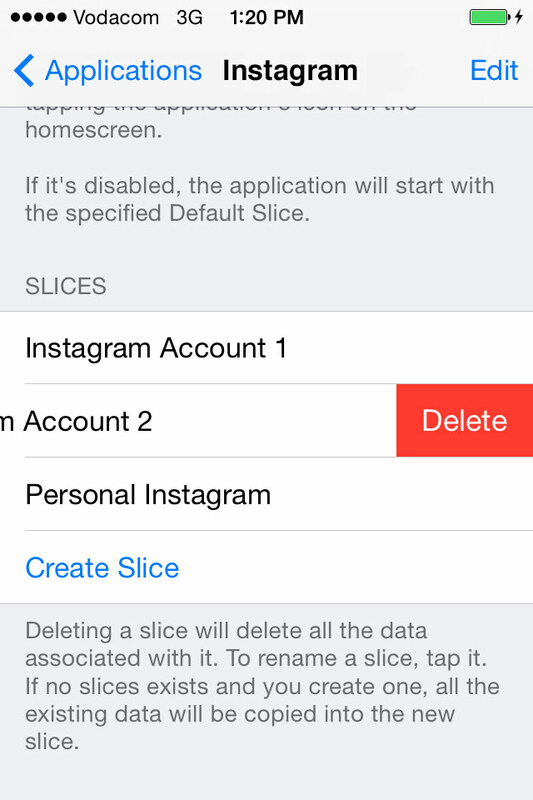 To my delight I recently discovered the solution to having multiple Instagram accounts, which is called “Slices”. It’s an app that allows you to switch between multiple Instagram accounts on your iPhone easily. In fact it will let you load any number of profiles in any app that only allow for one account. Very nifty indeed. What’s possibly even better than having multiple Instagram accounts on your iPhone is that Slices goes goes beyond simple login credentials. Slices allows for multiple instances of the entire app, meaning things like settings and other app data can be kept separate. Think this as a work around that allows you to effectively run multiple versions of all any iOS app. It’s a very big deal. Enough about em bigging-up slices – this is how you do it. If you know what you are doing you should be done in an hour or so. First thing is you need a Jailbroken iPhone. Do a Google for “Redmond Pie” and see what the latest and safest Jailbreak method is these days. *If you have an App that you don’t change the slice (Account) of often, you can go back into Settings -> Slices and disable “Ask on touch” . Then you will always be logged into the last account, and you will have to change the account it logs into in the Slices preferences pane and set the Default slice. Deleting slices is easy. 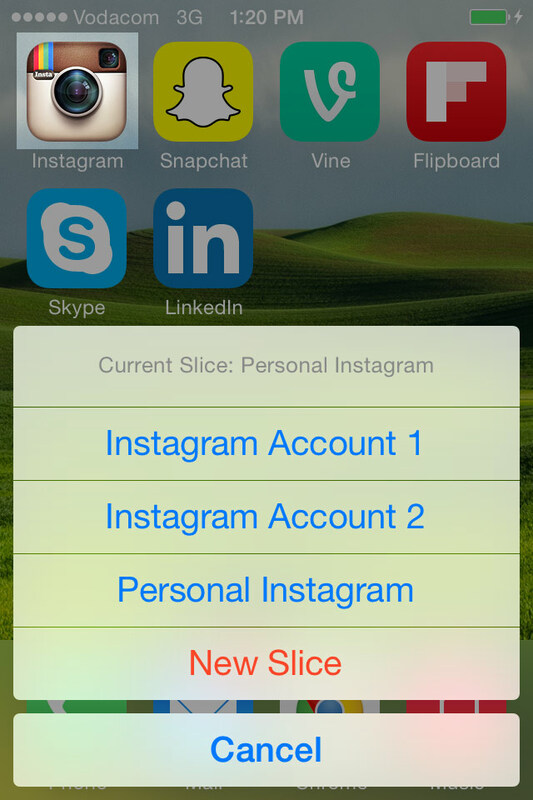 Just go into “Settings -> Slices”, go into an app, then swipe left in the account in the list of slices. I found a bug where you had to go out back and back into the slices to delete more than one. Unfortunately this is a downside. You will only get a notification from the account that was last active in the app. So if comment notifications are crucial, you might need to rethink how you use slices. This is by far the quickest way to switch between Instagram accounts (I’ve found so far), so until Instagram, Vine and SnapChat update their apps to allow this functionality natively, this is the way to go about it. Here is a video from the developer explaining what it’s about and how to instal it. It’s worth noting that updating your apps will delete your slices for that app. So if you have lots of slices and don’t specifically need the features in the new version of an app, then it’ll be worth skipping an update or two. Also keeping a list of your slices somewhere would be useful incase you are forgetful.